OREGON, Wisc. 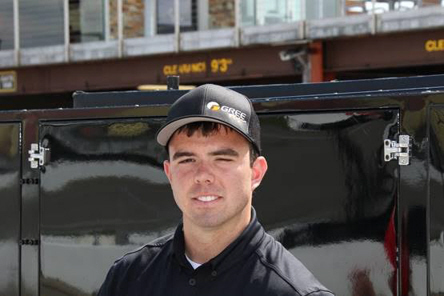 – ARCA Racing Series presented by Menards SCOTT Rookie of the Year leader Gus Dean (@gusdean) heads to Madison (Wisc.) International Speedway on the strength of three consecutive top-five finishes and hopes to make it four in Friday night’s Montgomery Ward 200. Last weekend at Michigan International Speedway, the Bluffton, S.C. native looked assured a podium finish in the Irish Hills, but a blown tire exiting Turn 2 on the last lap sent the No. 32 GREE Cooling Products Toyota from third to fifth. Not all was lost though, as Dean wrestled his bruised car to its sixth top-10 finish of 2017. Looking at the misfortune in a positive way, Dean heads to another new track for the fifth time in 2017 eyeing his second career ARCA victory and first with Win-Tron Racing. Returning to short track form for the fifth time this season, Dean knows his team’s short track program led by crew chief Todd Myers is one of the strongest in the garage. Outside of a mechanical failure at Fairgrounds Speedway Nashville in April, Dean has posted a second, seventh and fifth in his last three outings. Armed with the same No. 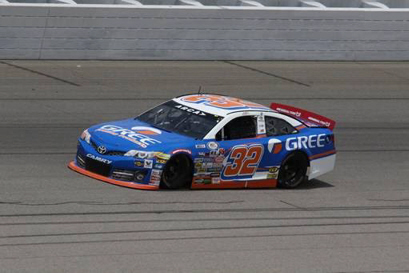 32 GREE Toyota that finished second at Salem (Ind.) Speedway in April and most recently fifth on the tight and treacherous Elko (Minn.) Speedway, Dean looks to Friday night’s as an opportunity to keep the team’s momentum rocking entering the halfway point of the season. Tightly fitted in a current race for third in the championship standings, Dean says his team is focused on performances. With strong results, they know the points will tally. “I don’t consider us out of this championship yet,” added Dean. “We’re not going to go down though without a fight. We just gotta keep top-fiving them and see what happens. In 15 ARCA Racing Series starts, Dean captured his first career victory in his second ever start at Talladega (Ala.) Superspeedway after starting second in Apr. 2016. Overall, Dean has five top-five and nine top-10 finishes and has led 21 laps in ARCA competition. The Montgomery Ward 200 (200 laps / 100 miles) is the ninth of 20 races on the 2017 ARCA Racing Series presented by Menards schedule. Practice begins Fri., June 23 with an hour and a half practice session planned from 1:30 p.m. – 3:00 p.m. General Tire pole qualifying is set for later in the day at 5:00 p.m. The race is set to take the green flag later in the day shortly after 8:00 p.m. The event will be broadcasted live on MAVTV, while ARCARacing.com will stream live timing and scoring throughout the week’s activities. All times are local (CT).